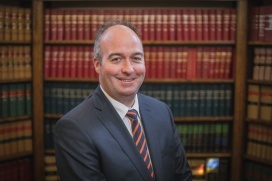 Greg also practices as a Corporate and Commercial lawyer, including Incorporations, Commercial Litigation, Shareholder Agreements, Partnership Agreements, Asset and Share purchases and sales. Greg has participated as both a volunteer and an employee with Community Legal Services at the University of Western Ontario, the Centre for Addiction and Mental Health and the Youth in Conflict with the Law Bail Program. As a team leader with Pro Bono Students Canada, he assisted local non-profit groups in drafting workplace policies to ensure compliance with human rights and employment standards legislation. Locally, Greg has been involved as a member of the Public Legal Education Committee and volunteered in the preparation and running of the Kelly Cup, a moot court competition held by secondary schools in the Durham Region. When out of the office, Greg enjoys recreational hockey, skiing and golf.